This last year has been a wonderful adventure and my eighth year practicing the alchemical art of orgone. Earlier in the year, I had honor of taking an amazing Lemurian Seed crystal and crafting it however I pleased. This was a commission with a twist, and I am so grateful for the opportunity (thanks again Ron!). What came through was the Sirius Altar, a three stepped sculpture encase in a pyramid. Very powerful, and in easy piece of orgone to get a buzz from! In February, we cruised south to Tucson. Way too much fun was had being around all of those crystals! We returned with scores of fine cut crystals, pounds and pounds of exquisite quartz points for everything from TB’s to SP’s and CB’s. ( I picked out a few dozen that I have made available for sale- they are listed here). I posted a photo album of the trip here. In April, we went down to the bay area and did the New Living Expo in San Francisco. You may of saw us there sharing a booth with Nick Edwards, the Pyramid Man. This has always been a really fun show to do for a variety of reasons. It is so nice to see all of our friends, many of whom we may only see that one time of year. Also thanks to Ty at Health Force, for inspiring me to make some orgone plugs. They have been a big hit and a lot of fun to make. As the weather started to warm, I reorganized my entire workshop which resulted in a flurry of obelisks, pendants and unique sculptures. It seems like if I wasn’t in the studio pouring, I was out in the bee yard working with the hives. During the course of the summer, the Diamond Obelisk, Sphere of Life Obelisk, Rainbow Bridge Obelisk, and Phantom Cheops Obelisk all came into being. The Cheops Obelisk was also a commission and I poured over an entire month into its creation. Certainly one of the most detailed and intricate creations I have ever completed (thanks to Ben for the opportunity!). I was also able to bring the Obelisk of the New Time to it’s next level of expression. The entire obelisk was given a white phosphorescent pearlescent layer. It’s extremely bright in the dark and is fully inscribable. In other words, with my UV laser, I can cast runes, and seals that hold their illumination on it for up to an hour at a time! Here is an example of the Mayan glyph “Warrior” written in light on the obelisk. This last year, I was also able to expand beyond some limitation I was feeling in regards to the shape an orgone sculpture has to take. Basically you are limited by the mold you use, so you will see common themes of circles, cone, hearts, etc. I played around with “free form molds” with great success. I had the inspiration to design an orgone sculpture like the shape of a sail boat. This resulted in the Dow Sippapu, and the Blue Ray Catherdral. The techniques employed to make this happen where entirely new to me, which took a little getting used to, but gave great results. I will probally do more works of this style in the future. Sadly, this was also another year in the ongoing conflict surrounding chemtrails and geo-engineering. Many people are waking up to the situation and want to know what they can do. We made four Chemtrail Busters this year and over a thousand Tower Busters to help conteract the electrical, and pathogenic pollution being spread across our planet. 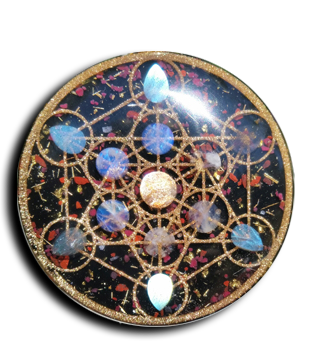 Because of such a demand and overwhelming response for Orgonix orgone, I set up a few collections for other people and stores to have available. You can find Orgonix now at Earth’s Store in Arcadia, Soul Connections in Mt Shasta, and at the Center for Lifestyles of Light here in Nevada City. And of course a nice selection at Roxanne’s store in Grass Valley, Humble Fabrics and Crafts. This year I also revisited the art of silicon mold making and created over dozen new small and intricate molds for pendants. Some of these include the “Heart Chakra Star,” “Trinty Knot,” and “Tao of 8” molds. These are only a few of the new styles I have ready to go so there will be even more exciting pendants to show you as 2013 progresses. This last year I made major strides into metal smithing, something I have been wanting to do for a long time. I finally threw down for some sheet metal, disc-punches, stamps, dapping tools, saws, files, and buffing equipment. It has been so much fun working in this new medium, especailly on the rainy days. I look forward to doing a lot more in this area next year. So what is next? A question I ask myself a lot these days. As a pioneer in the field of orgone art, my drive is to create sculptures which manifest an energetic pressence that is healing, informing, and enlightening. It is an honor to be able to do this as much as I have in the past. When I go to work in the “White Star Orgone Lab,” as I lovingly call it, I feel moved by spirit to create art that reflects aspects of consciouness. The muses for my endeavores are often based on 13:20 mathematics, sacred geometry, or chakra theory. I really shouldn’t even call it work because it feels like play. So in 2013 I will continue to do my best to provide the highest quality orgone products I can. Of course, without all the wonderful people out there that support this endeavor, it really wouldn’t be possible, so let me take this moment to thank you! It is my pleasure and honor to make this alchemy available to all.